Fred – age 4 – Happy to be going for a ride! Fred is our 5-year old Basset Hound. We were lucky enough to get Fred at 2-years old from a cousin who could no longer take care of him. Right from the start, he's been the most gentle, good-natured, well-behaved dog we have ever had the pleasure of owning. He doesn't bark (except when he wants you to play the "chase" game with him) and he doesn't lick or jump. He loves our cats and our kids and anybody else who comes by. Most of the time he's sleeping on the couch, but will get up (most of the time) to greet whoever is coming in the door. He doesn't beg for food (we don't give him table food) and he loves going for a ride in the car. He does shed A LOT, but we feel it's a small price to pay for such a great dog! Fred doesn't like the sound of the gardeners when they come to mow the lawn, and will shake and cry at the door until he's let in the house. We discovered early on that he's also afraid of dog doors but for us it's okay - if we had a dog door, our indoor cats would surely get out while Fred stayed inside. Where did you find this dog. I think he may be mine. I gave to someone for safe keeping. Fred was my inside dog and I'm lonely without him. He loves rubber chickens and will play pretend growl with it. I liked for me to say. Gimme that chicken. Our neighbors had a Basset Hound when I was growing up. We used to love to go visit the Robeson's house just to see their cool dog with the long hears and low-rider legs. We also liked the lemon meringue pie Mrs. Robeson used to make! 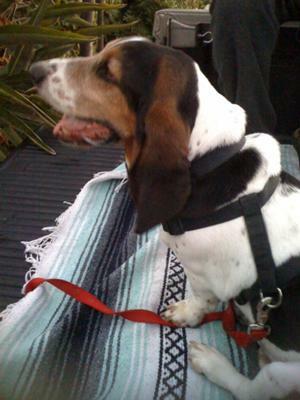 Funny thing is, I was just visiting a friend last week and got my Basset Hound fix. Their dog is named Henry and he is quite a character. While I was sitting on the couch, Henry jump right in my lap and gave me a kiss. THAT was quite a surprise. Henry doesn't bark much either, but he sure will talk if you encourage him. What a riot!